As long as you plan on using a needle to puncture the skin, you need to sterilize it. There are basically two ways on how to sterilize a needle - one is by heat application, and the other is by use of chemicals like soaking it in hydrogen peroxide or rubbing alcohol. The choice of method will depend on what you need the needle for, for how long, and the means of sterilization available to you at the time. There are various types of needles meant for different purposes. For example, some are meant for sewing, but they can also be used for stitching a wound. Some are hollow as they are meant for injecting and extracting fluids. The different needles need to be cleaned differently. The hollow needle, for example, should be cleaned on the inside as well as the outside. When sterilizing a needle, you need to consider its material as well. Needles are made of glass, metal or plastic. Chemicals might react with some metals resulting in poisonous combinations. When using plastics, remember that they have low melting points and sterilization by heat is a bad idea. Always have this at the back of your mind before sterilizing a needle. Before touching the needle, wear gloves. If you do not have any, thoroughly wash your hands and wrists. After sterilizing your needle, you do not want to contaminate it again. Use tongs or spoons to collect the needle. Do not touch it with your gloves after sterilization. Place the needle in a container if you wish to store it. Before you sterilize your needle, make sure you have cleaned it well using soap and water. This will get rid of any blood, grime, or dirt left on the needle. This is especially important if you have used the needle before. Use a sterilized syringe to run water and soap through a hollow needle. Afterwards, rinse the needle thoroughly with sterile water and not distilled water, as the latter might contain bacteria. A gas-fueled fire is the best choice since it leaves the least residual behind. Put the tip of the need in the flame until you see it glow red. This is the most convenient way to sterilize a needle at home but not the best since the needle could pick up dirt from the air after being heated. If any residual is left on the needle, wipe it with a sterile gauze pad. This method is suitable if you are removing a splinter. However, it is not ideal if the needle is going to be used for medical purposes or piercing and tattooing. A steaming pot can also work. Put water in the bottom pot. When it begins to boil, put the needle in the pot that has holes over the boiling pot and cover the lid. Allow it to steam for 20 minutes. If you are wondering how to sterilize a needle while you’re at home, you can simply boil it. You can pour hot water about 100°C (212 °F) over it or drop it in boiling water. This method is good to use at home, but not the best. Even after boiling for 20 hours, there still will be some microorganisms that remain. This method will work on metals needle by boiling for 10 minutes, but just to be safe boil it for 30 minutes. This is only suitable for needles being used to remove splinters or jewelry care, but it is not the best for sterilizing medical equipment. - Bleach. For 5% chlorine you can use it undiluted, but dilute 10% chlorine 1:1, or 15% chlorine 2:1 with water. An autoclave is used to sterilize needles in commercial salons or parlors. Needles should be put in special sterilization bags and put in the autoclave with a strip that will change color when the process is complete. Once the strip and the needles in their pouches are put in the autoclave, adjust the pressure and the timer. When the cycle is complete, put the autoclave on the vent option for it to vent. Make sure you wear sterile latex gloves when removing the needles after the heat and the pressure gauge reads zero. Make sure the needle pouch is dry. 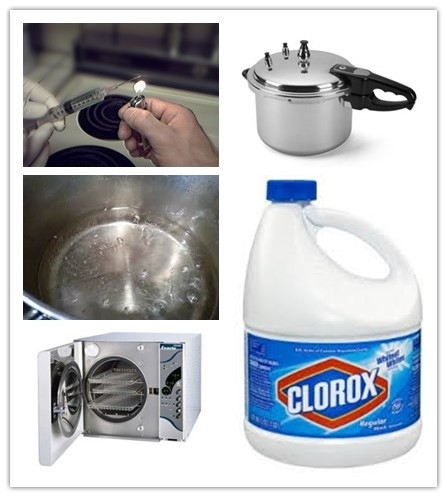 If you are wondering how to sterilize a needle most effectively, then you should use the autoclave method. However, note that it only works for metal needles. Server responsed at: 04/22/2019 4:53 a.m.